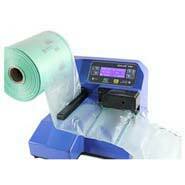 8" x 5" Filler Mini Air Clasi Film by Ameson are used in the Mini Air Clasi air pillow machine. This film makes a 8" wide x 5" long air pillow with 2296 ft of HDPE film. 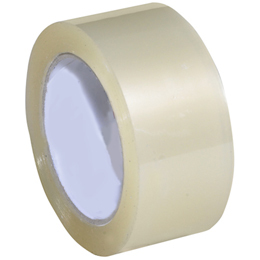 Simply load the 8" x 5" Filler Mini Air Clasi Film film on the film holder, and insert the roll with the black line on the air pipe side to begin the operation. Press "SET" to change the Temperature, Length and Air Volume that you need. The recommended temperature (S.T.) is "170". Press "ENT" to save the data. Then pre-set the desired meter length (M) of film and press "ENT" to save the data. Set air volume that is recommended between 6-10 and press "ENT" to save the data. Then feed the film's air channel over the air pipe. Press "IN/OUT" and pull the film slightly at the same time. Press "START" to inflate the film. Press "STOP" to stop inflating. 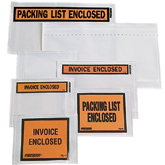 Tear off the cushion bag at the perforation and you are ready to package your goods. Filler Pillow Size: 8" x 5"